If the title of Rem Denizen’s new solo show, “TRANS-META-PARA-UBER-HYPER-HYPNOPOMPIC: Uncanny Iconoclasm and The Mushroom of Liberty,” sounds inscrutable, it might be because the artist was inspired by a similarly mystifying moment. The Portland-based artist is captivated by a mundane yet magical state of mind: the dreamy space between being awake and being asleep—that moment before you drift off to sleep at night, or the minutes after your morning alarm goes off, when you helplessly sway back into slumber. The paintings and sculptures of “TRANS-META-PARA-UBER-HYPER-HYPNOPOMPIC,” now on view at Jason Jacques Inc. in New York, attempt to chart territory in that surreal no man’s land. The show features three series by the artist and maker. The first, “Inkblots with Nature and the New/Old Masters,” consists of nature-based images reshaped as symmetrical paintings. Bovine Spongiform Encephalopathy and Broken Mirror (both 2015) are reminiscent of Rorschach inkblots; like the psychiatric test, the artworks are designed to challenge the human mind and activate the imagination. The second series, “30-60-90 Uncanny Geometry,” also references traditional psychological methods. 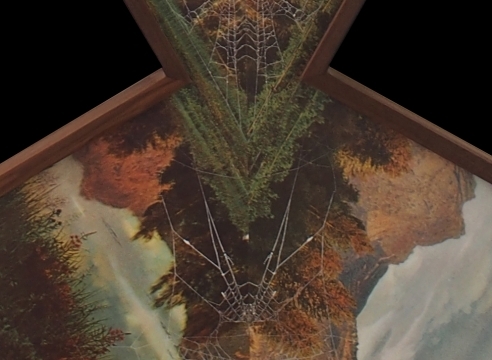 Here, Denizen starts with appropriated imagery, slathering the surface with ink, then printing over it with leaf skeletons and spider web–like designs. Finally, he cuts the images apart, organizing the pieces into groups of triangles. Gramma Anima and the Aurea Catena (2016) is like a dream; Axis Mundi (2016), a nightmare. Denizen’s sculptural third series, “(Statues)...of Liberty,” signals a departure in medium. Works such as Mushroom of Liberty and Box cutter of Liberty (both 2016), the artist has said, caricaturize the idea of liberty and, in parallel, the erosion of civil liberties. Captured in copper and enamel, the pieces are beautiful yet perplexing, like a hazy dream that has spilled into reality.